The Hollies Day Nursery is among the very best early years settings in the UK, scooping a top accolade at the National Day Nurseries Association Nursery Awards. 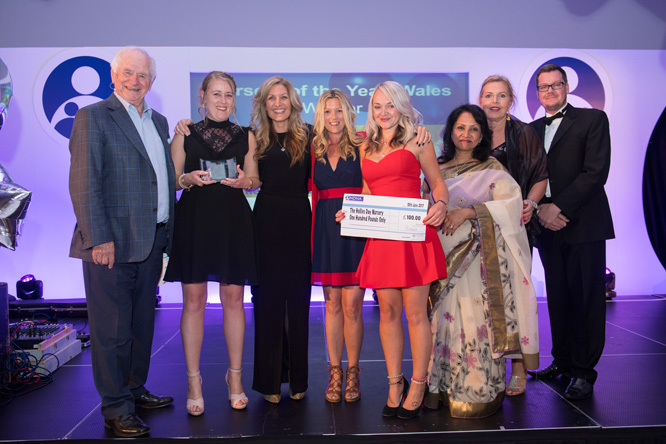 The nursery in Cardiff won Nursery of the Year for Wales, triumphing above scores of other entrants to win the prestigious title – presented by TV star and maths legend Johnny Ball. The NDNA Nursery Awards, sponsored by early years resource provider Hope Education, were announced at a glittering ceremony at Emirates Old Trafford, Manchester. The event was attended by the cream of the nursery sector and followed NDNA’s day-long annual conference. The expert judging panel was impressed with The Hollies, where walls were covered in the children’s artwork creating a vibrant and encouraging atmosphere. Judges found their dedication to partnerships with parents in regard to providing an innovative takeaway food option amazing! The award category was sponsored by Hope Education. Commenting on the honour, nursery director Lisa Cronk said: “We are delighted to win NDNA Nursery of the Year 2017 for the third time! “Year after year, we adapt our provision, introduce new initiatives and tailor our services to meet the ever changing needs of our children and parents. We fully embrace change which is crucial for sustainably, growth, raising standards and achieving quality. Family is at the heart of everything we do. “Each day, we aim to ensure that nursery life is a positive, warm and nurturing experience for each family. As we enter our 15th year, our mission statement remains as relevant today as when we first opened. Families whose children attend nurseries also contributed to the judging process by voting for their setting, making the awards the true ‘parents’ choice’. Corwen Day Nursery was runner-up in the category and Caerleon Child Care, Cardiff, was highly commended. Purnima Tanuku OBE, Chief Executive of NDNA, said: “The judging process was particularly tough this year and glowing testimonies from parents and family members really helped to form the final decisions. Working closely with local and national governments in England, Scotland and Wales, we campaign on the cost, choice and quality of childcare to benefit nurseries, families and the economy.